'A Narrative of Her Past together with Biographies of her Leading Men' was compiled by W.B. Kimberly over a period of two years, and was published in 1897. 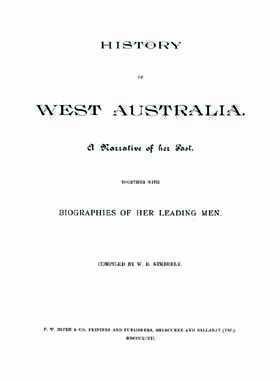 The first (and larger) section is a history of Western Australia from the discovery of Australia through to May of the year of publication (1897). Public works and the goldfields. Photo pages are dispersed throughout the history narrative. The second section is a biographical section of notable Western Australians. The information on each person is quite detailed usually covering several pages. It provides information on the roles these people played in the colony of Western Australia as well as their education, achievements and family. Each biography is accompanied by a portrait. This detailed and comprehensive account of Western Australia's past and her leading men provide a wonderful, easy to read and interesting tool for local and family historians.